Indoctrination, propaganda, and fanaticism paved the way for gyokusai (玉砕) - a term derived from an old Chinese aphorism that went along the lines of it being better to die as a shattered jewel, than to live as an intact tile. 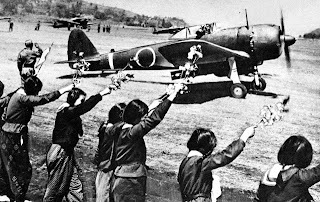 Kamikaze Images is a good resource for more information on this topic, particularly from the Japanese viewpoint. 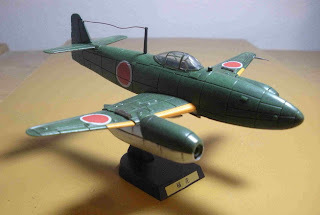 As the war situation became more desperate for Japan, this type of thinking lead to the development of a number of special attack (tokko) weapons to carry out suicide missions. The majority of them were not used, and of the ones that were, most were militarily ineffective. 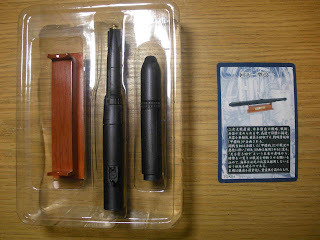 The Special Attack Weapons (特別攻撃機) set produced by Boford Japan, was released back in the middle of 2007, and replicates some of these tokko weapons in 1/72 scale. Comments: Plastic parts. The wings look undersized, and are about a scale foot too short. 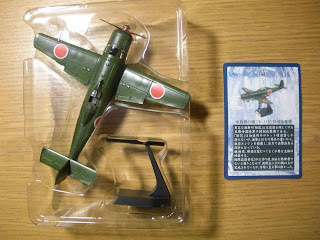 Comments: I'm still kicking myself for not getting the MPM Kikka while it was still in productions, so I don't have anything to compare the size of this version with. The body is made of plastic, with an overscale copper aerial. It may be a bit too long. The wings also look undersized, and it has ugly giant hinges protruding from the wing surfaces. 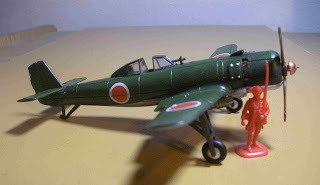 The model comes with a detachable bomb, and working landing gear in the wings, but not for the nose. There are no bays for the wheels to retract into, so they protrude from the underside of the aircraft. Comments: Plastic body. Comes with model of engine. Thick, ugly overscaled sights. Scales out very nicely. Comments: Comes in two pieces. 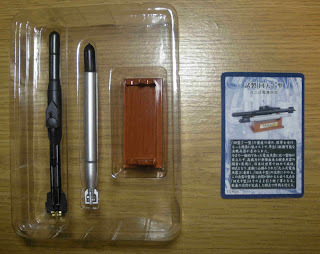 The forward section is diecast metal, while the rear portion is plastic. 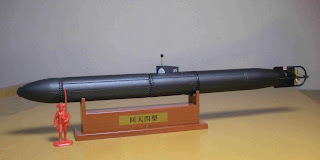 The model was put together so that the rotation of the rear section is a bit off. 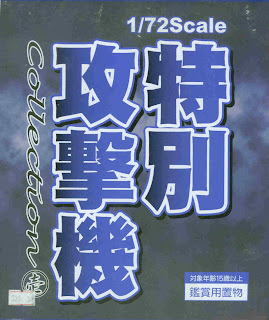 It is overscale by about a foot, and noticably longer than the Fine Molds Kaiten. Comments: Comes in two pieces. 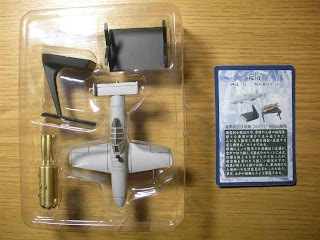 The forward section is diecast metal, while the rear portion is plastic. Possibly a couple of scale feet too short. I could not find a reference for the length. Comments: The forward section is diecast metal, while the rear portion is plastic. 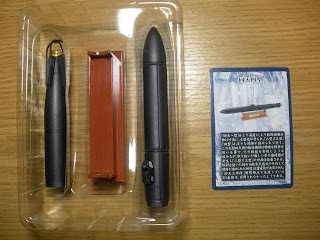 The front of the torpedo is improperly attached so it appears bent. The torpedo does scale out nicely at about 23.5 scale feet, but I could not find a reference for the length of the Type 10. Comments: Plastic body. 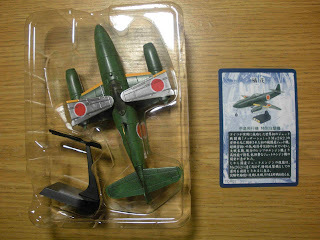 Comes with model of propeller. Scales out to about 15 feet long, but I could not verify if this is the correct length. Comments: Plastic body. 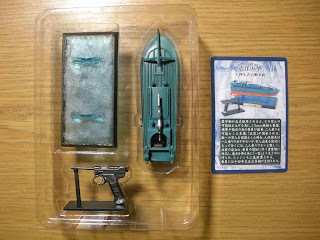 Comes with model of Nambu 13mm pistol. Length scales out well, but may be a tick too wide. 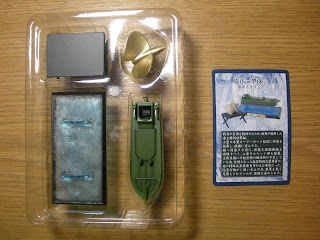 There is also a secret figure which is a 54mm miniature of a fukuryu (伏龍) diver with pole mine, but the set I purchased did not come with it. Ultimately, it's better to live as an intact jewel. 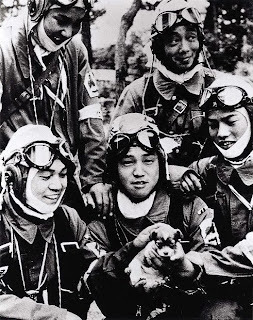 At least one of these pilots was just 17.